Lakeside will forever hold a place in my heart. My dad, Earl W Moore, started this business 30 years ago in The Hub shopping center and we have called The Hub home ever since. In 2008, I stepped in to help run the business as Dad battled Leukemia. After he passed and I took over the business, I was full of confidence. How hard could it be? I had an accounting degree from the University of Richmond and 8 years of corporate management experience. Well, I am so thankful for a client base that was loyal, patient and forgiving of my growing pains as a business owner and tax professional. I can’t imagine another community being so gracious. Lakeside helped me develop into the professional I am today and I will be forever grateful to the clients and community of Lakeside. 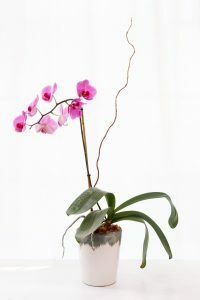 What does that have to do with an orchid you might ask? In 2013, my mom, Judy Moore, sold her house and my wife, Amanda and I adopted an orchid from her. While eating dinner with my family last week, I noticed the orchid was in full bloom. Amanda commented that it was the first time it had bloomed since being in our home. So the first time this orchid blooms is right as I’m relocating the business? That was a sign to me that Dad was right there with me, supporting me during this emotional time. I have plans to memorialize this orchid at the new location. I hope it will keep the spirit of Lakeside alive in the new space and make you smile the way it made me smile. Farewell, Lakeside and thank you for the memories! This entry was posted in Blog on August 8, 2016 by c11723713.